The stele erected by the Municipality of Trieste in the cemetery of Servola, in memory of the victims of the Italian air raid of April 21th, 1916. A little known page of the First World War, the centenary of which is just being celebrated, revolves around the air raids that the city of Trieste, then first port of the Austrian-Hungarian Empire, had to suffer from Italy. But for Trieste, the centenary of this war of “liberation” was moved one year ahead. It wasn’t until May 24th, 1915, that Italy took action, repudiating its the alliance to the central Empires by siding with the Powers of the Entente (United Kingdom, France, Russia). Trieste was the main target of the Italian attack. The occupation of the first Austrian-Hungarian port would have meant bending the Empire on its knees. The ones portraying themselves as “liberators” from the Austrian oppressor had no shame proceeding with terroristic attacks agains an “open” city, causing numerous victims among the harmless, civilians who lived there. This was the presentation ticket of a State which, through the brutal violence of its foreign policy, had reached a suffered-for national unity. Of which Trieste had to represent the final step. EL RE BOMBA !!! – THE BOMB KING!!! El ga merità. – He sure deserved. Del ludro re bomba ! – The bomb of that jerk, the bomb king ! Copar amalai ! – Killing the ill ! Del bravo re bomba ! – of the good bomb king! CHRONOLOGY OF ITALIAN AIR RAIDS AGAINST TRIESTE FROM MAY 24 1915 TO OCTOBER 1917 (from the Austrian bulletin of war, with comments from the Triestine newspapers of the time). July 7th: Italian Aviators drop bombs on Trieste, no relevant damages. Since lately many enemy aircrafts are attacks are taking place, it is an absolute necessity that the existing ordinance regarding the necessity to keep all the windows of the city dark in the evening is respected as strictly as possible. Failure to comply with this provision means being at risk of the most serious punishments. We do also warn you that, for the sake of the safety of the population, at the sight of enemy aircrafts it is absolutely necessary avoiding screams or other exclamations . October 29th, 1915. An Italian aircraft drops bombs on the Miramar castle. Novembre 5th, 1915. An Italian airship drops a significant number of bombs against Miramar. March 15th, 1916. Italian pilots bomb Trieste, causing no damage. April 18th, 1916. Two enemy aviators fly over Trieste and bomb it, killing two people of the civil class and wounding five more. April 21st, 1916. Yesterday, in the afternoon, seven Italian aircrafts dropped 25 bombs on Trieste. Nine people of the civil class, including five children, were killed and five more wounded. The Convento dei Salesiani, in the Church of which were attending the Divine office 400 children, was destroyed. With this air raid, the enemy has lost any right to beg for mercy for its own cities. May 26th, 1916. An airship dropped many bombs on Trieste in the night, but failed to cause wounds or other damages. August 16th, 1916. On the morning of August 15th, seven enemy hydroplanes, most of them French, attacked Trieste with the protection of three French battle aircrafts and covered by enemy torpedo boats and motor boats in the open sea. Our aircrafts battled against them. Involved in the air battle, flight lieutenant Banfield forced an enemy aircraft to get down in the middle of the gulf; the aviators were probably wounded. He then run after a second aircraft and had it suddenly crashing at Miramar; the aviators laid dead; the aircraft, a Sba 308, was recovered by our men, it was wrecked. Enemy aviators dropped several bombs on the port, but no significant images were caused. As far as we know, two were killed and one person was severely wounded, while a fourth one only suffered minor wounds. September 14th, 1916. 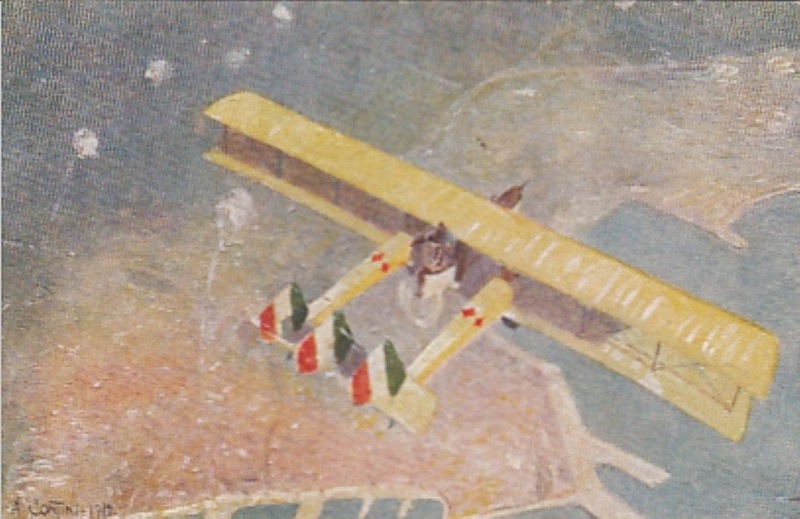 In the afternoon of September 13th a squad of enemy aircrafts consisting in 18 Caproni, protected by 3 more aircrafts, committed a raid agains Trieste. To support the operation, in the gulf there were 6 torpedo boats and two motor boats, all crafts belonging to the enemy. Several bombs were dropped, but only slight damages were caused, and none to the military. As far as we know, a man suffered minor wounds. Flight lieutenant Banfield, engaging in air combat, forced an enemy defense aircraft to land and retreat behind enemy lines. Our aircrafts and our defensive anti-aircraft warfare hit the torpedo boats of the enemy. October 14th, 1916. Again, enemy aviators dropped bombs the old port of Trieste and near Miramar, but without causing no damages. They were chased by our hydroplanes, flight lieutenant Banfield engaged the enemy into combat, forcing one of the enemy aircrafts to swoop right behind enemy lines. March 11th, 1917. Last night, Italian aviators bombed the cities of Muggia, Isola and Pirano. March 20th, 1917. Trieste was once again hit by enemy bombs. April 9th, 1917. On the morning of April 8th (Easter) enemy aircrafts bombed Barcola and Sistiana. No damages. June 2nd, 1917. 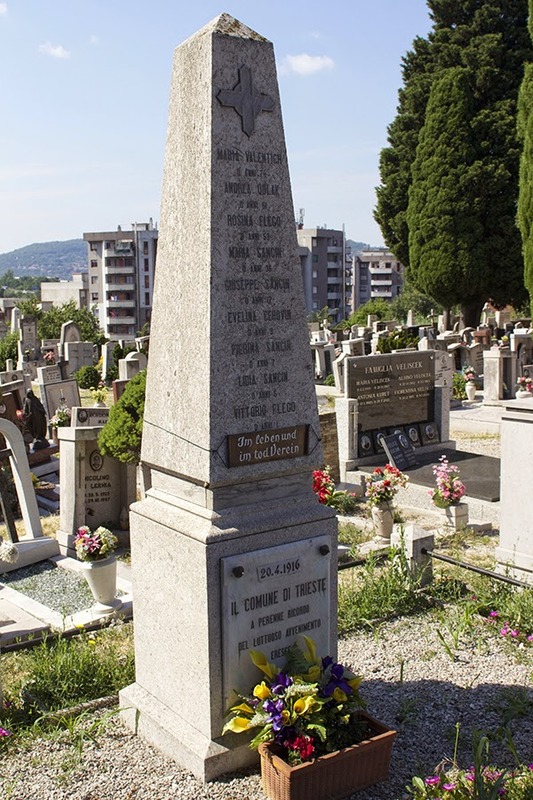 From May 31st to June 1st… enemy air raids agains Trieste killed a boy. No material damages. In the night, during a chasing, our victorious flight lieutenant Banfield successfully shot an enemy aircraft down while in the range of the enemy. We lost no aircraft. June 2nd, 1917. Italian aviators bomb Trieste and other parts of Istria, a woman and a boy were killed. August 20th, 1917. Enemy explorers bombed the open city of Trieste killing many inhabitants. A magnificent sunny day, the sky wonderfully blue, cobalto sea, lovely countryside: a voluptuous Summer Sunday perfect for a stroll. All the streets were crowded with people, the light-colored vests of women and children stood out. Around 7PM a dark rumble, repeated, echoed in the valleys, alarming the whole population. The blasts repeated over and over at least seven times. People rushed, crowded along the seashore or on the piers, gazing at the sea to see where the sinister bolts were from… plumes of smoke were reaching the sky. Rumour had it that it was a fire, spreading quickly, but it remains an allegation. However, unfortunately, here were several victims: two adult women, two girls and two boys all died, only two little sisters were identified as Gisella and Eleonora Laurencich, they were 10 and 14 respectively. We have seen their mother being overwhelmed with sorrow, unable to part from the horribly mutilated bodies, calling her girls by name and with sweet words. A heartbreaking scene. Several were wounded, and precisely: 9-year old Carlo Bandas, a serious wound on his left hip. A 2-year old infant girl, her name unknown, her face seriously wounded, she has lots an eye. Sixteen years old Ms. Blasevich suffered a complex fracture to her right leg, later amputated at the hospital; soldier Kancion, suffered a complex fracture to the jaw and the jaw area; the mother of the Bandas boy, injured to her right tight; a woman, about 20 years old, her name is unknown, was wounded to her heart and is in very critical conditions; a K.u.K Lieutenant suffered a very serious and deep wound to his stomach. A woman passed away while being transported to the hospital, she wasnot identified yet. Some houses and mansions were damaged. The Lieutenant, together with the cons. aulico [consigliere aulico, a member of the Austrian Hofkriegsrat, the Court Council of War] doctor Mahkovec reached the place, comforting the wounded, including poor Mrs. Laurencich, who lost her daughters, leaving her some money. The wounded were all transported to the city hospital, where they received primary care from the director, doctor Gortan and then surgically cures by doctor D’Este. Among the persons with minor injuries, there is even the niece of the Counsel of Sweden, Mr. de Lesson. We invite the residents to keep calm and to not panic. TRIESTE IS AN OPEN CITY, meaning it has no fortifications, so it cannot be bombed. August 27th, 1917. Today at 9AM Trieste was once again bombed by a squadron of Italian airships. In the inner city fell about 20 bombs, causing quite a significant amount of material damages. Two people were killed. Several wounded. August 29th, 1917. Trieste has again been devastated by enemy aviators. The bombs dropped on the city caused no damages worth mentioning. August 30th, 1917. Yesterday Trieste was bombed by enemy aircraft for the second time, today in the morning it was the third time in 48 hours. Many inhabitants fell victims of the attacks. Many private-owned houses were damaged. August 31st, 1917. Yesterday at noon, for the fourth time, Trieste was attacked by enemy aviators, but no significant damages were caused. September 1st, 1917. Trieste was once again the target of Italian aviators. The palace of the Bishop was damaged. September 2nd, 1917. Even yesterday the open city of Trieste was devastated many times by Italian aviators: a total of 70 bombs were dropped on the city. September 3rd, 1917. An air squad proceeding against Trieste was driven off by our hydroplanes before reaching the target. As enemy aircrafts appear, which anyone can distinguish well due to tie immediate reaction being our defense fire, people in the streets shall shelter themselves in the front door of houses. These frontiers shall be held open until the closing time in order to be absolutely accessible. Those in need of a shelter shall be granted free access at any time. In case of an immediate threat, whoever does not reach a shelter in time should lay on the ground. During air raids, it is absolutely forbidden gathering on streets and squares. Do not go on top of roofs, nor on balconies. Sitting near the windows is dangerous due to the ascending, oblique dispersion produced as bombs explode. Being the housing attics and upper floors at the most risk, their occupants should move downstairs during the air raid, either to the lower floors or in the lobby of the house. As for lower houses, be advantaged by already existing basements. At the same way, you should teach little kids how to behave in the streets and at home. Unexploded bombs must be left on the ground and not touched, instead, inform the closest guarding station about their locations. I expect that, by strict adherence to the directions given from time to time by representatives of the Authorities case to case the population of Trieste participates in reducing to a minimum the dangers coming from above in case of air raids. Dr. baron de Fries-Skene m.p. September 4th, 1917. Trieste was again been attacked by Italian aviators. September 5th, 1917. Trieste was attacked twice by Italian aviators. September 6th, 1917. Trieste was again the target of two Italian air raids. September 7th, 1917. Attacks of enemy aircrafts against the open city of Trieste are occurring on a daily bases. September 12th, 1917. Italian airplanes are attacking Trieste one day after another. September 24th, 1917. A new air raid against Trieste was attempted, but ultimately stopped by our aircrafts and anti-aircraft warfare. On October 24th, 1917, after the Austro-German breakthrough of Caporetto (Kobarid) and the consequent defeat of the Italian Army, which precipitously retreated behind the Piave, the nightmare of Italians air raids against Trieste ends.